Choose a service to view details and pricing. Please note: Prices are subject to change depending on hair length, texture, service provider, etc. Please let us know if you have any further questions. 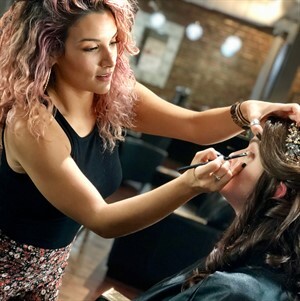 Our makeup artists work to make you look and feel your best, whatever the occasion! * Please call our wedding coordinator for onsite makeup services for brides and bridal parties. Please allow at least 24 hours for appointment cancelations and 48 hours for packages and group events. Any cancelations less than this will be charged 50%-100% of the price of the scheduled services. Please arrive 15 minutes prior to your appointment to ensure check in, time to change, consult, etc. Please be prepared with cash for gratuity, as we cannot add it to a credit card. Please contact us within the first seven days if you are not satisfied with your service(s).